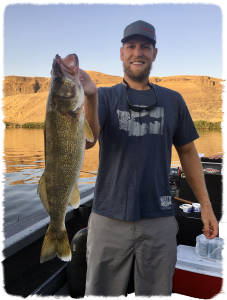 We fish Walleye on the Snake and Columbia River systems. In Washington, there is no limit or size restrictions. We begin fishing in March and continue through July. 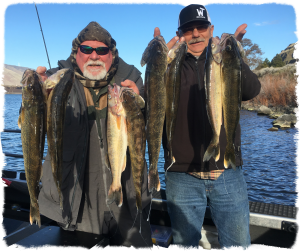 It is not uncommon for us to boat 30 to 50 fish a day when the bite is on, we also provide trophy Walleye trips on the Snake where we catch fish that are 10 pounds or greater. During our trophy Walleye season you may not catch as many, but the quality of fish outweighs the quantity of catch. Most of our trophy Walleye are caught between March and April.